IDAutomation's Hosted Dynamic Barcode Subscription is scalable, high-performance and fault tolerant. The service uses the Streaming Barcode Server for IIS product installed on load balanced Hyper-V virtual machines. IDAutomation has completed upgrades on both Hyper-V host servers since the performance test was performed in 2015. The new hardware is much faster than what was used in the test below, however, average response time may be about the same because of network latency. The test results documented below indicate this configuration may be able to generate up to 20,000 barcode requests per minute. Customers installing the Barcode Server for IIS product on their own systems may easily achieve higher performance with the latest hardware and by installing on the host directly, instead of within a virtual machine. The processors used in these tests are visible within the task manager screenshots of Fig 1 and 2 below. 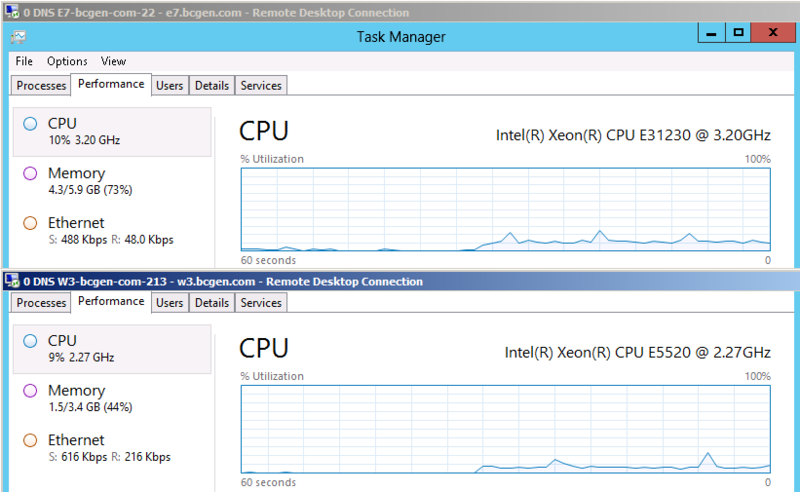 Two Windows Server 2012 Hyper-V hosts, Datacenter Edition, each with a Windows Server 2012 Virtual Machine configured to use 3 cores of a quad-core Intel Xeon processor. The two servers are hosted in certified datacenters in different areas of the United States. A proprietary DNS configuration load balances multiple client requests between hosts. A standard Streaming Barcode Server for IIS installation was performed. Standard barcode requests are performed using Code 128, encoding 20 characters consisting of uppercase letters, lowercase letters and 8 numbers, with default parameters. 2000 distributed clients request barcodes over 1 minute of time with the Loader.io load testing service. IDAutomation performed this test on Tuesday, April 14th, 2015 during business hours. 33 ms was the average response time for all clients to request and retrieve the barcodes. 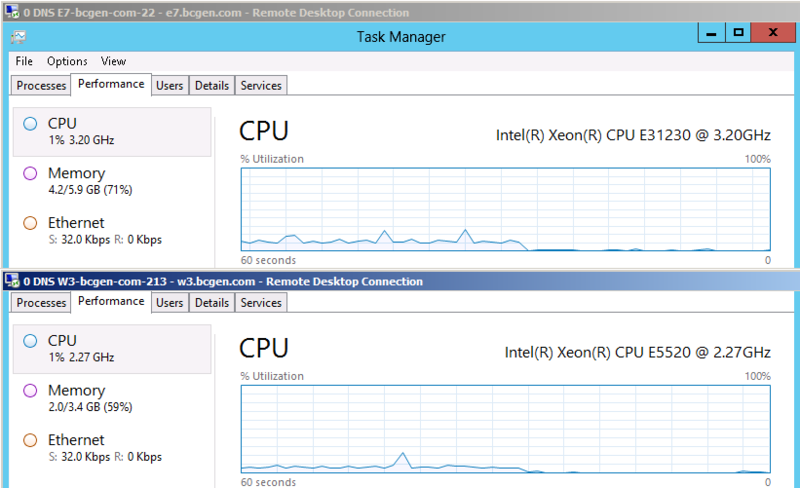 A Task Manager screenshot of both virtual machines during this test is shown in Fig 1 and 2. The average CPU load of the test for each virtual machine was about 10%. Fig 1. About 30 seconds into the test. Fig 2. About 30 seconds after the test. Fig 3. 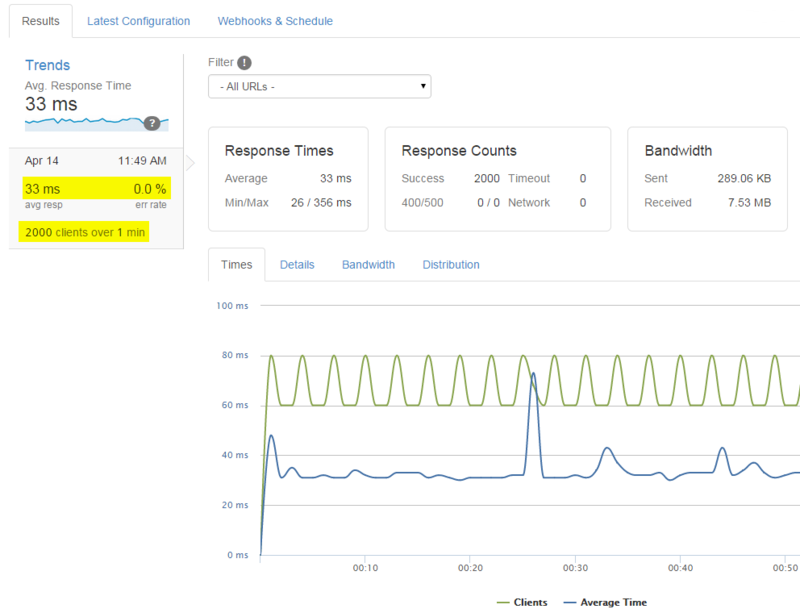 Results recorded by the Loader.io load testing service.